The decision to buy this model was extremely spontaneous. I got bored one afternoon and decided to check eBay for a good bid or two, like the kind i always see diecast forum users post. Upon researching Hot Wheels Elite, I came across a bid ending in 24 minutes so without thinking, i started bidding and eventually won it at around $50. Nearly half of what it’s actually worth! For an average price of $100 for most Hot Wheels Elites, there’s really no other comparison in terms of detail and craftsmanship. Sure you got the lower end AUTOarts, but under $100, you’d have a hard time finding a good deal. The folks over at Hot Wheels did a great job replicating the monster. The curves and lines flow seamlessly as if it was the real deal. 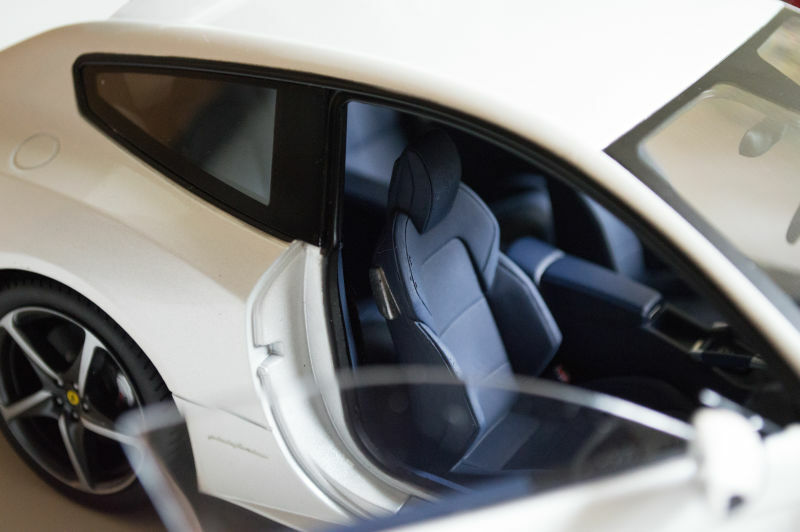 My particular model has no complaints whatsoever, except for a slight misalignment of the doors and the rear panel, but really, I’d be nitpicking. The wheels are a work of art themselves. They feature black inlay which helps give the look of the rims that much more ooomph (if you know what i mean). One of the main issues with past Hot Wheels Elites are that the wheels and brakes are out of proportion as compared to the rest of the car. However, for once, HOTWHEEL LISTENED! The size of the wheels fits perfectly and ride height seems spot on. Hell, look at the details on this thing! Something you’d expect to see on a AUTOart! Now i rarely give 10/10s on anything, because there’s always something to nitpick. However, i was blown away by the level of detail underneath the hood of this 600hp wagon. 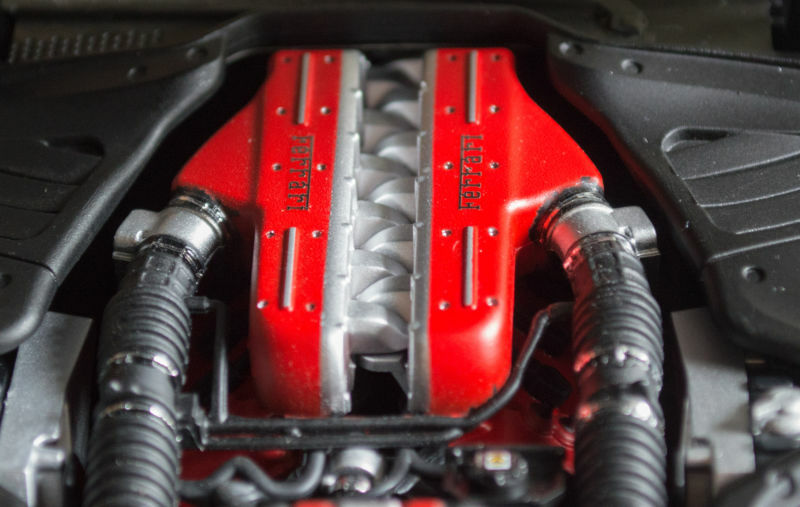 Codename F140EB, the V12 in the wagon churns out 651 hp and 513lb-ft torque… making that faster than the Enzo. The motor is executed to perfection. Compare the picture above to a real FF engine, and you’d be hard press to find any major differences. One thing I have to note is the panels gaps on this model are very minimal. In fact, it almost seems like the hood doesn’t open. Accessing the engine actually proves to be quite difficult. I had to use a toothpick to press up through the hole used for the wires that held it in place when it was new. But hey, only models with very minimal gaps have this problem, so I’m not complaining. 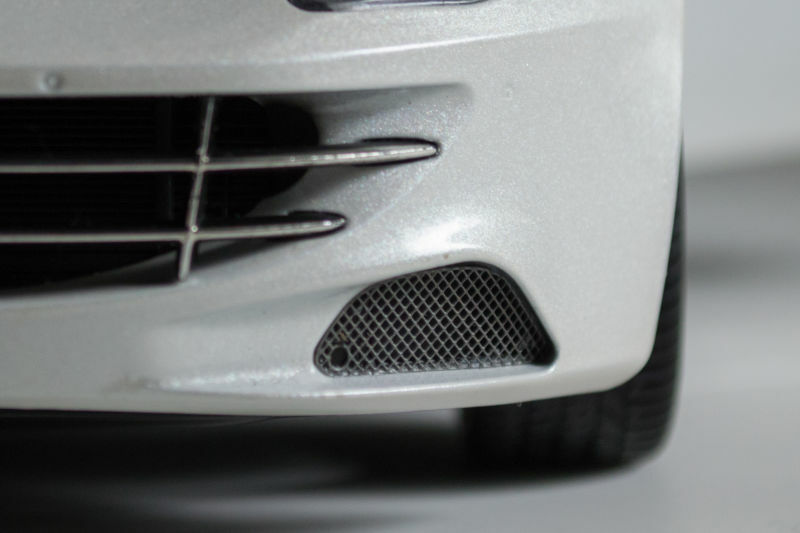 The front fascia is executed just as nicely as the rest of the car. Something that really caught my eyes are the photo-etched grill and meshed lower vents on either side of the car. At first, I thought they were simply a solid piece of plastic painted on, but fortunately, cost cutting was not an issue here. 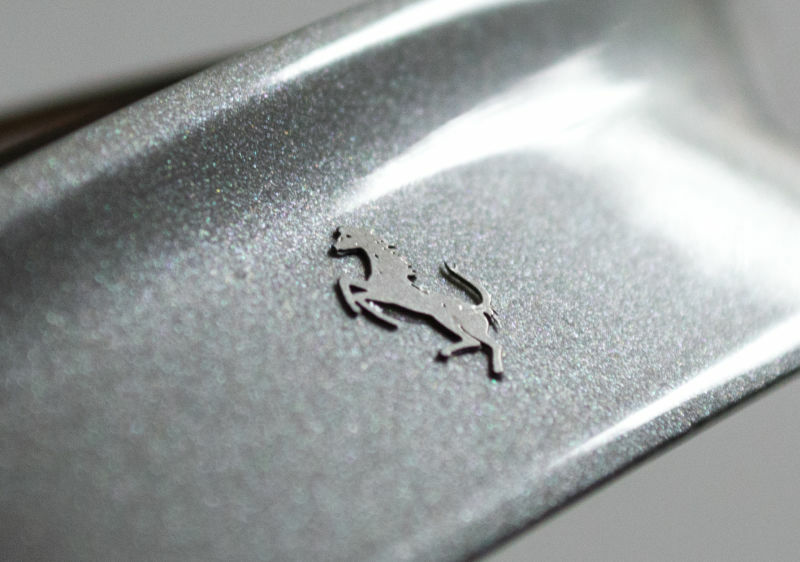 Even looking at the prancing horse logo in the middle is just as mesmerizing. Bravo Hot Wheels! Bravo! Basically what was said about the front, can be said to the rear. Everything seems about right, with the exception of a few plastic grill inserts along the side and by the taillights. Once upon a time, interiors on Hot Wheels Elites are considered some of the best. The dark blue is exceptional against the pearl white exterior. Blue and white always makes a great combination on nearly any car. The interior doesn’t feature any carpeting, which is a bit of a disappointment. Also, the center console features a huge blank screen, which detracts the overall feel of the interior a bit. However, on the positive side, the steering wheel is flawless. it even features the famed Manettino switch on the wheel! The seats have this rubbery feel of it, making it almost seem like actual leather. Now keep in mind that I edited the pictures a little, so in reality, it isn’t as blue as it seems. I can’t stress enough how great of a deal this model is at it’s current price range. It’s ridiculous to think a model that normally cost around $75 puts a few AUTOarts to shame. 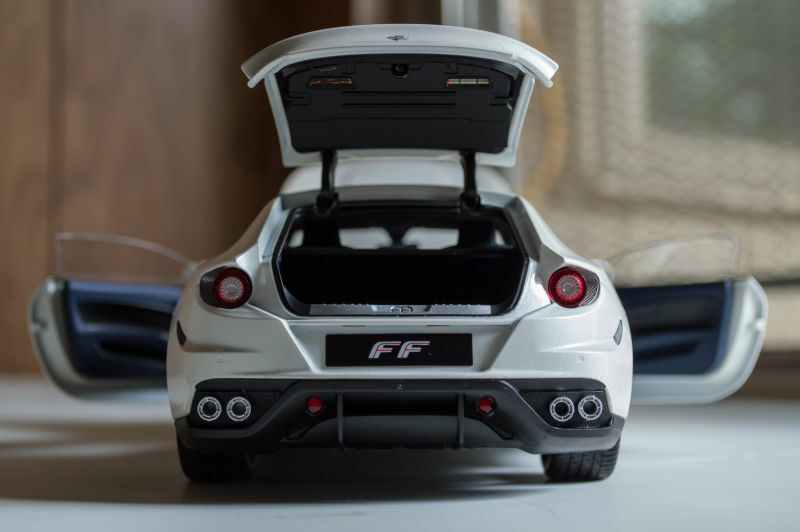 Heck, it puts the Hot Wheels Elite LaFerrari AND the 458 Speciale to shame. Keep in mind the LaFerrari costs twice as much, yet it offers less detail… ironic isn’t it. The level of detail on the doors are through the roof. Almost everything you’d expect are faithfully represented. I mean Jesus Christ, look at this thing… Now the model is a few years old as it came out nearly 4 years ago. However, it was during a time when Hot Wheels Elites excelled at fine craftsmanship at a relatively low cost. Unfortunately, that is definitely not the case with recent models. 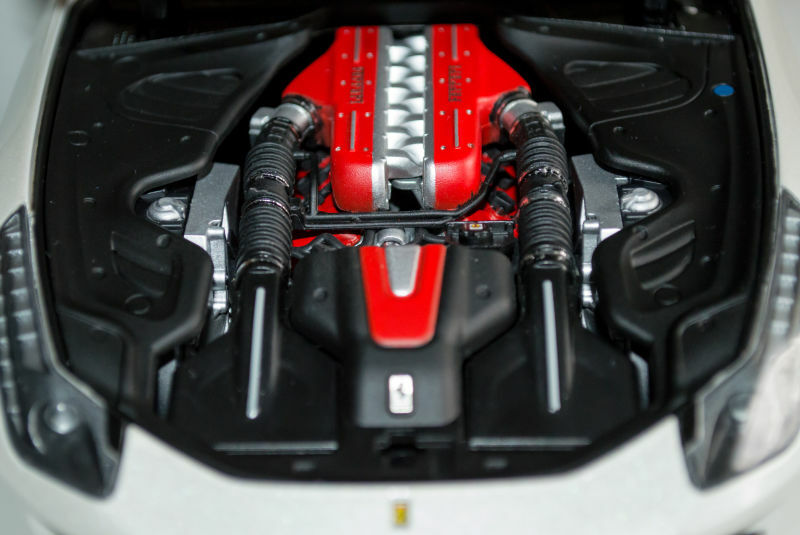 Both the Hot Wheels Elite Speciale and LaFerrari suffer from horrendous quality control. Along with the Fast and Furious Dodge Charger by Hot Wheels Elite, it seems like Hot Wheels has lost its way as their license with Ferrari slowly came to a crawl about a year ago. I dare say the recent Bburago Signatures take on the same models are definitely better for a FRACTION of the price. 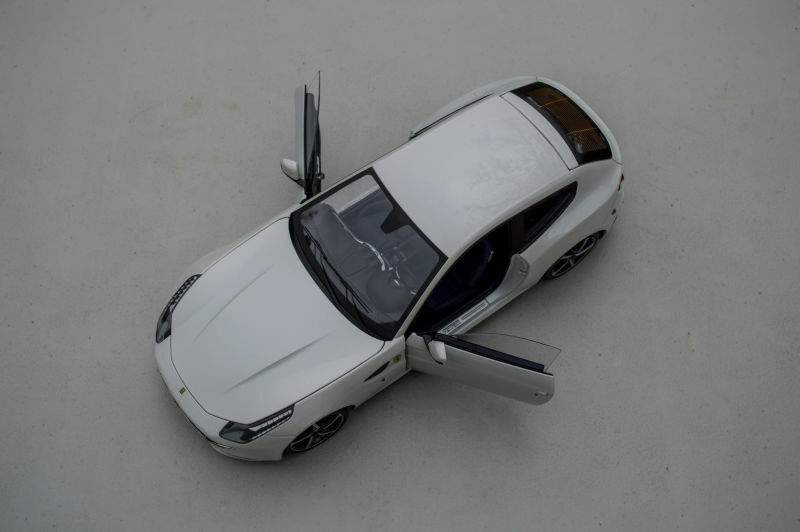 So verdict is, if you want a Hot Wheels Elite Ferrari at the apex in terms of quality, purchase either a FF or F12. Both can be found for ~$100. 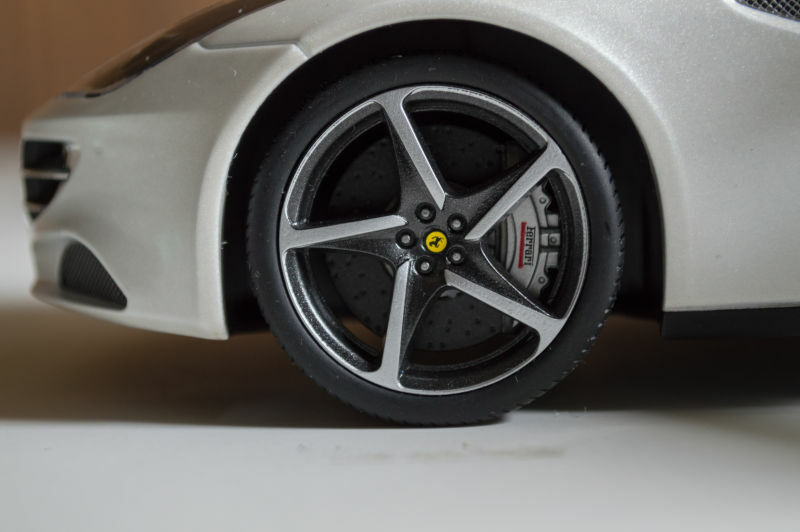 6 Responses to "REVIEW: Hotwheels Elite Ferrari FF"
Thanks for the review. I know shes not new, but I had to shares with others how good this model is, and how far HWE execution did come from their humble beginnings. Thanks for your exceptional review. I also have this model in this color. Your pictures are outstanding, and I agree with your comments. Mattel did not achieve this level of quality overnight with their Elite series. Let us hope that Bburago (or some other diecast mfg.) can soon achieve this level of execution at this price point with their diecast Ferraris. $50? I have a good mind to kill you out of envy. 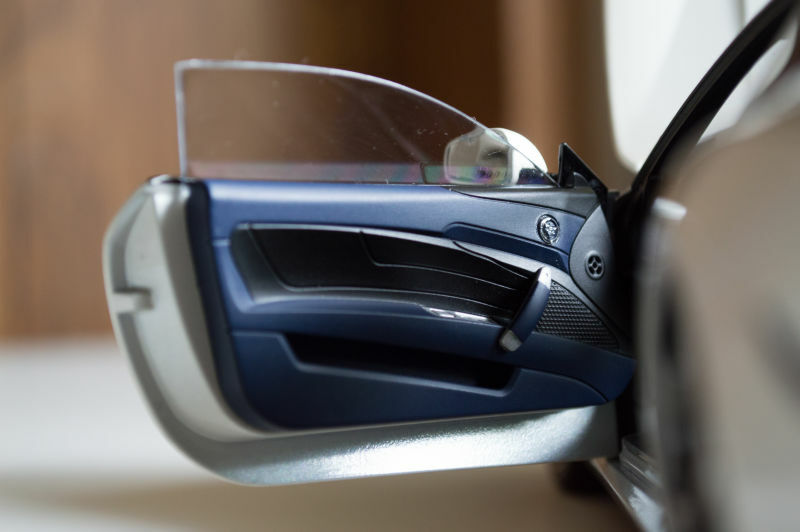 I spent $80 on the HW Foundation version of the FF, and now I am resigned to spend my days looking at the bonnet which I know would have opened had I paid more…and now you tell me, less. Ohh. 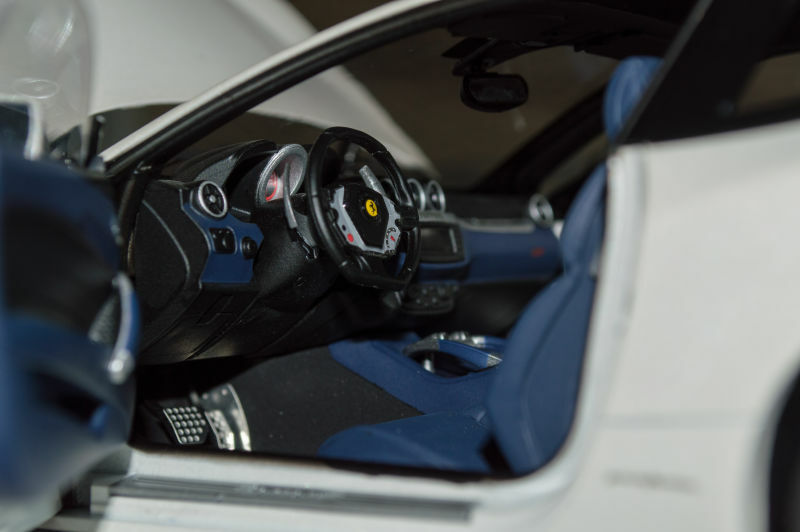 On a different tack, the Bburago Signatures are certainly packing a punch, and I’d say their dashboards show better execution than this HWE Ferrari FF. 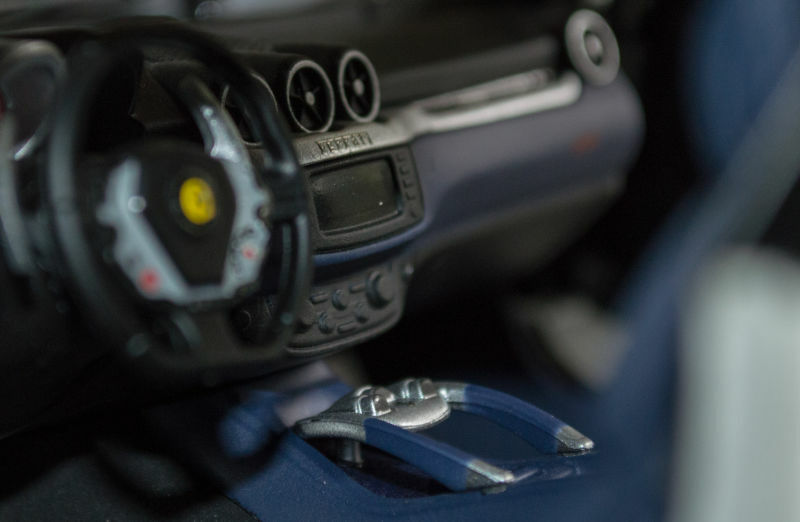 Take a look at the Bburago Signature Ferrari 458 Speciale interior, and you’ll be amazed. The quality of this Hotwheels Eltie is top! The same quality as a Kyosho!!! I do not own the car reviewed, but I do have a couple of comments about the consistency of the Elite brand in general , I do own a number of them and in spite of all the good work done by that offshoot brand there are sometimes elements and aspects of them that bring the names Mattel (toys) and Hotwheels (need I say more) looming large in my mind ! like, I’ll agree that like some other companies their ability to transform plastic into many forms and textures is a wonder , BUT THEN sometimes the quality of the plastic used is like an abrasion to my eyes That because of its vast difference from some other other contiguous part that is of a much higher tooling or material. The writer of the review compares Elite to Kyosho and yes, I know that both of their names sometimes appears on a box together leading one to believe they’re the same……..I don’t believe they are !! 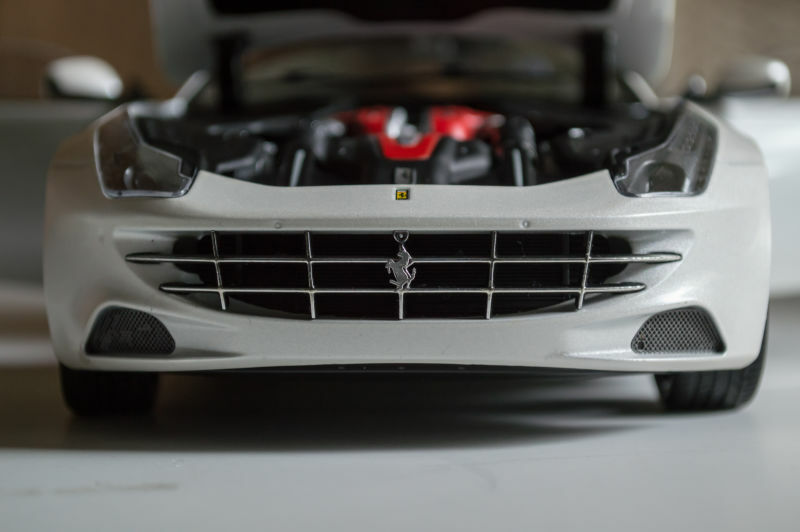 The reviewer spoke to how Elite spared no expense on the Front fascia and grill , but then fails to install carpet, or maybe puts the gauge cluster on a decal sheet In a Ferrari ?? ?, oh come on !! I guess I’m saying that yes Elite , has certainly produced from time to time some exceptionally decent pieces, but they can’t be counted upon to do it from one car to the next Most all the manufacturers exhibit variances in the levels of their pieces , don’t ask me why but the jumps in production quality made by Elite are the most off putting !